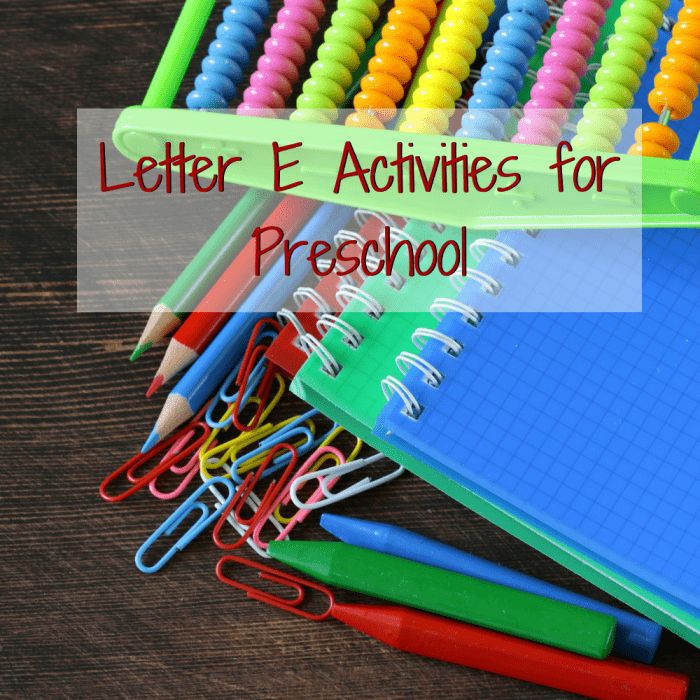 Letter E activities for your preschooler! I’m gonna be straight up honest with you and say that I don’t know the different between a long vowel and short vowel. I mean, I know what they are but I never remember which is which. One makes the sound e and the other -eh but I have no clue which one is which. All this to say, maybe I am not the best person to take advice from on teaching your kids the alphabet, but here’s the thing. 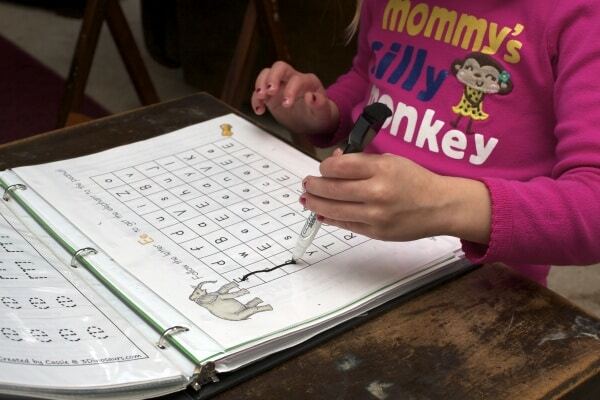 Kids will learn to read even if they don’t have all the phonics rules and sight words memorized. Because my kids loved the sit-down style of preschool, that was what our homeschool preschool looked like. Sitting down every few days to do our Letter of the Week worksheets. They spent a majority of their time playing but we also read books and spent time with our homeschool group. Keeping all this in mind, homeschooling during the preschool years doesn’t have to be difficult. All you need are books, play time, and the ability to spend time with your kids. 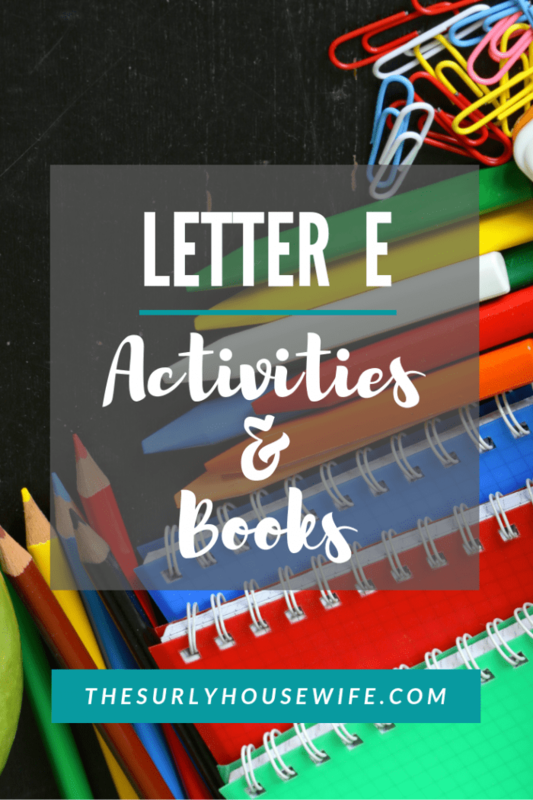 This blog post will include some books and printables for the Letter E. Let’s get to it! Download this cheat sheet for preschool planning! Woot! Check your email for your free planning sheet. Make sure to check your spam if you haven't received an email from The Surly Housewife. Elephants are one of my favorite animals so I printed whatever elephant printables I could find. These alphabet mazes from 1+1+1=1 were my girls favorites!! Click here to download Alphabet Mazes from 1+1+1=1! 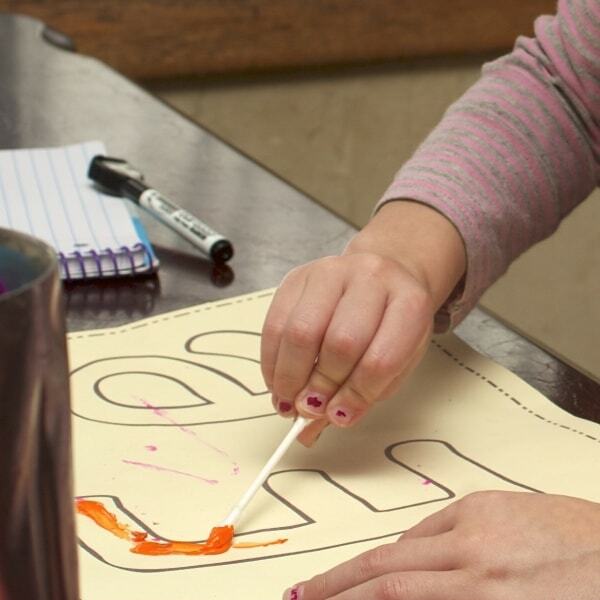 You can use dot markers, pom poms, magnets, markers, or crayons to complete the maze. But because my girls love these so much I put them in sheet protectors and they complete them with dry erase markers. This way they can do them over and over agin. After several times, we take them out of the sheet protectors do some Q-tip painting. They both love to paint so this was a big hit! 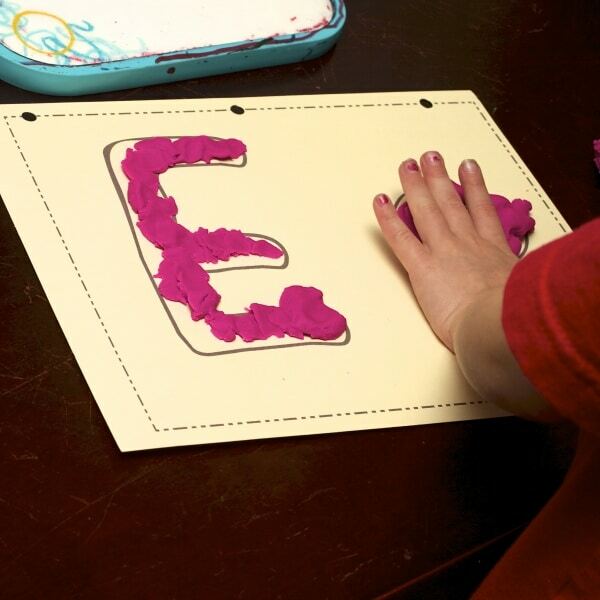 Another printable we frequently did was rainbow writing. It’s simply writing the letter over and over again with different letters which give it a rainbow effect. It’s an easy way to begin learning how to write the alphabet. They can also be used at play-doh mats which my kids prefer much more than the rainbow writing. They are both play dough junkies so they really enjoyed this. The mats are just regular card stock so the play dough does stick. However, if they were laminated it would have made for easy clean up. We also painted the letters. Bear used a regular paint brush but Harley wanted to continue with the Q-tip paints. Please tell me you loved this book as much as I did growing up?! Grandma Tildy lives all alone so when a pet salesman arrives at her door, she agrees to a pet but NO ELEPHANTS! This book is sure to excite young readers. Ella is excited for school to start but she is also really nervous. Will she make friends? What if they don’t like her? Then her grandmother gives her a red hat as a lucky charm. Will this do the trick? Some additional books for the Letter E! This children’s classic with its unmistakable rhyme has cemented its place as a children’s classic. One of my favorite read alouds. The Little Engine that Could by Watty PiperCheck out our past Letter of Week work here. 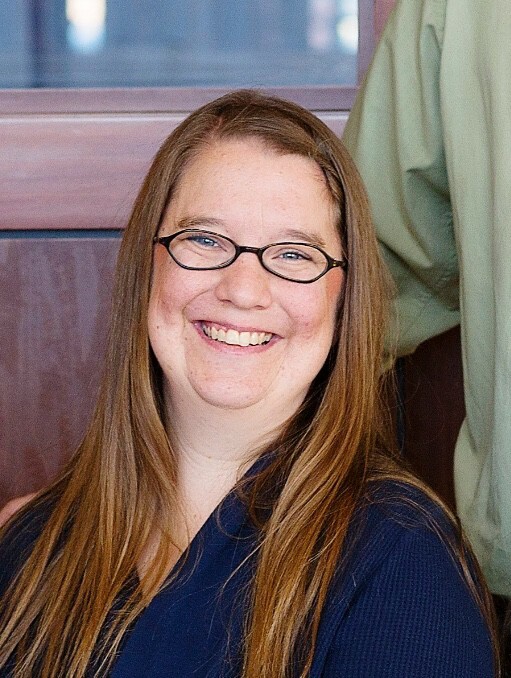 The story of a little blue train who helps toys and gifts for kids. It’s signature pep talk teaches kids the importance of never giving up. Ping’s goal of delivering beautiful flowers to the Emperor is foiled when his pot doesn’t grow any flowers. Read more to find out how Ping’s failure leads triumph. There you have it! Some ideas and books for the Letter E. I hope you found something you can implement in your homeschool!! Thinking of Homeschooling, Read this First!